Continuous Improvement is the output of a good Quality Management process, and Continuous Improvement requires the proper application of quality tools and techniques. One of the most recognizable Quality Tools is the "Deming Wheel". The Deming Wheel is a simple diagram that focuses efforts around four processes: PLAN, DO, CHECK, and ACT (PDCA Cycle). While this diagram may seem simplistic at first sight, it is a very powerful tool when applied to projects. In fact, Project Management is dependent upon the PDCA Cycle to deliver effective results. A quick summary of the PDCA Cycle follows. Plan is the initial phase of the PDCA Cycle. High levels goals and objectives are agreed upon and resources are acquired. In this phase we are identifying a particular problem or problems and breaking them down into manageable tasks. We want to decide specifically how we will solve the problem and establish metrics to measure progress. Do is executing the Plan. Also, reporting is done in this phase to check progress. Do can be prototyping in the IT world, designing experiments, constructing a building, building a model, etc. Check is the evaluation phase. Did we do what we said we were going to do? Did we meet the project's objectives? What does the data tell us? This is where are metrics are analyzed. We are looking at our KPIs (Key Performance Indicators) and making recommendations for action. Act is the adjustment phase. What are we going to do to get back on track or to make improvements? Should we continue or cancel the project? Do we need to re-plan and start the cycle over again? Here we are acting on our findings from the Check phase. We want to make sure we are acting on the right information at the right time. 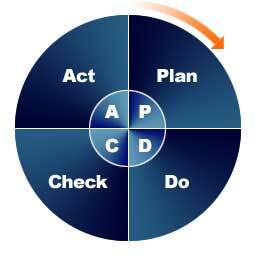 The PDCA Cycle is a great tool to help us be successful in Project Management. Using proven Quality Management tools that support Continuous Improvement will help project managers to do a better job managing their projects. Combining these Quality Principles with your Project Management Processes will lead to powerful results for your customers. Do you have a Theory Z? Visit projecsteps.com and leave a comment. Ralph Nader once said, "I start with the premise that the function of leadership is to produce more leaders, not more followers". In the IT world it is hard to produce leaders, and it is doubly hard to produce and keep followers. On his blog, Alexander Kjerulf talks about How Not to Lead Geeks and mentions that "the main reason IT people are unhappy at work is bad relations with management". He goes on to say that "the fact is that IT people hate bad management and have even less tolerance for it than most other kinds of employees". Wow, I couldn't agree more. I see the mistakes listed below happen every day. I can only wonder how much more productive "geeks" would be if these mistakes weren't repeated on a regular basis. Programming and most IT work is a creative process, not an industrial one. Geeks must constantly come up with solutions to new problems and rarely ever solve the same problem twice. Therefore they need leeway and flexibility. Strict dress codes and too much red tape kill all inovation. They also need creative surroundings to avoid “death by cubicle”. Happy geeks are productive geeks!